If you have been lucky enough to come across some sea glass, you may want to use it in a beach craft or for jewelry. I found one piece—no, my mom found one piece and gave it to me while I was visiting her in Florida! Lucky me – it washed right up on the beach where we walked each morning! Apparently it is becoming harder to find this glass which is actually from broken bottles or other glass that have been tumbled at sea for a long period of time. Through this natural process, the pieces become smooth and rounded and get a frosty appearance. The most common colors to find are clear, browns or greens since these come from broken bottles. My piece is a light cyan or pale blue and is probably a little bit rarer to find. Although hues of red, yellow and orange are the rarest. I would think that if you find a perfectly rounded jewelry grade piece of glass, then you would want to make it into some kind of pendant that you can wear with pride. However, for the rest of that glass, there are still great ways to show it off. If you are like me and have just one treasured piece of sea glass, you may want a decorative way to display it. I used mine to embellish a birch candle holder. 1. 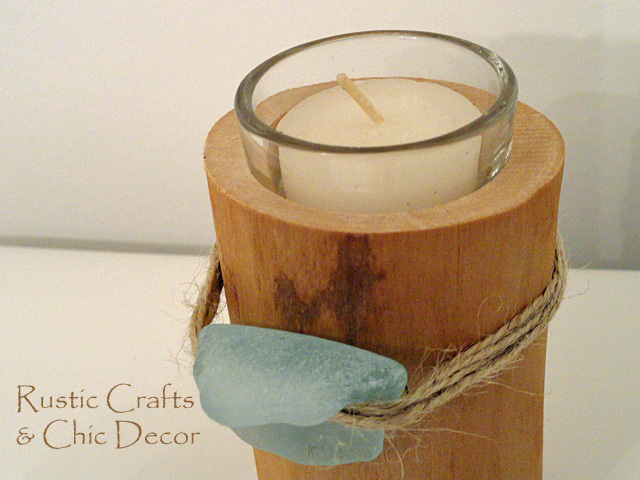 Cut a section of birch log the desired height for your candle holder. I peeled off the bark for a nice clean background to show off the sea glass. 2. Using a drill with a circular bit or a drill press, cut out a hole to fit a glass tea light holder. 3. Cut a long section of jute string, loop one end around the candle holder and tie the end in a knot at the back. 4. 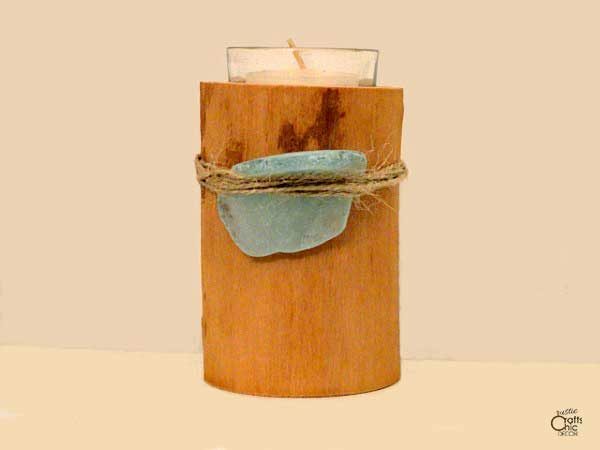 Place your sea glass at the front of the candle holder and begin wrapping the string around the glass and the candle holder several times to hold it in place. It works really well if your glass has a lip to it. If not, you will want to loop the string from around the back of the candle holder, around the glass and then around the back of the holder again. Repeat this several times. 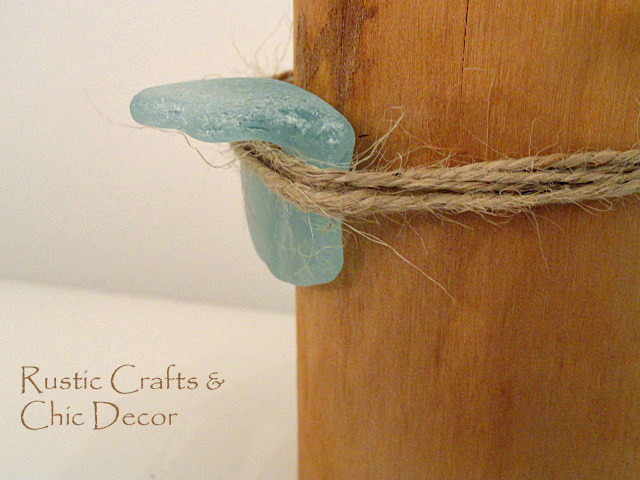 Loop sea glass to birch candle holder with jute string. 5. When you are done looping, tie the other end off to the beginning knot strings at the back. Add a dot of glue for extra support. 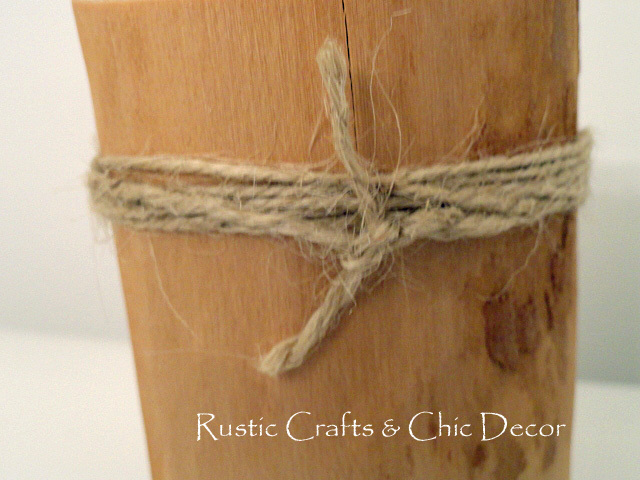 Tie ends of jute string together at back of candle holder. 6. Insert your glass tea light holder and tea light. Insert glass candle holder and tea light. And the candle holder beach craft is complete! Because of the blue green color of the glass and the spa like feel of the candle holder, I display this in my bathroom. It has a calming effect that I love.